PG&E’s stock price plunged more than 21 percent Wednesday, one day after the utility submitted a filing with Securities and Exchange Commission (SEC) stating it may struggle to weather the financial blow if its equipment is deemed the cause of the Camp Fire. Over the last week, the PG&E stock price has plummeted from about $49 a share to about $25, and it fell as low as $23 on Wednesday. 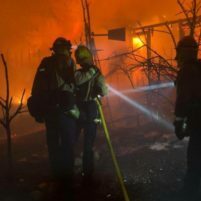 “While the cause of the Camp Fire is still under investigation, if the utility’s equipment is determined to be the cause, the utility could be subject to significant liability in excess of insurance coverage that would be expected to have a material impact on PG&E Corporation’s and the Utility’s financial condition, results of operations, liquidity and cash flow,” PG&E stated in the SEC filing. The Camp Fire started on the morning of Nov. 8 in an area of Butte County where PG&E had reported an outage. The blaze has burned 135,000 acres and is 35 percent contained. As of Wednesday, the death toll of the Camp Fire has risen to 56. In addition to becoming the deadliest blaze in state history, the Camp Fire has also become the most destructive in terms of number of structures destroyed, having already destroyed 7,600 homes. Investigators have yet to determine the cause of the blaze. Recently adopted state legislation allows California utilities to bill their customers in order to fund legal settlements stemming from destructive wildfires that occurred in 2017. The new law also applies to future wildfires, starting next year, but it does not shield utilities from the potential financial impact of settlements over 2018 wildfires. The law aimed to prevent utilities, like PG&E, from entering bankruptcy as a result of being found responsible for starting major wildfires. PG&E now stands accused of having started multiple recent wildfires, though the allegations are, at least not yet, backed by official findings. When you follow the money, it may look like this: We pay the insurance companies for fire insurance, many houses burn down then PG&E pays the insurance companies for the fire damages they have accepted responsibility for, next we pay PG&E as the ratepayers to cover their expenses. Do you see this scenario happening and in the everyone gets a rate increase instead of the insurance companies paying their debt? This is great to spread the risk and increased profits for the insurance companies. Communism at work, right in front of our faces where it can hide? Time to buy PG&E stock! The state of California is going to shut off all fossil fuels in just a couple of decades, (Natural Gas), and only electricity will be left. Never mind the Grid can’t handle our needs now and a huge chunk of our electricity is generated by Natural Gas generators. The California government can not allow much of anything to happen to PG&E. Nothing has been proven yet as who is at fault. But recently many fingers have been pointed at PG&E. If in fact it comes to be that PG&E is at fault instead of the government lining their pockets with fines, fees and whatever else they can extort I have an idea. How about if PG&E acquire air tankers and strategically place them close to where there are identified faulty power lines.? This way PG&E will actually invest in the problem instead of the state wasting the money. These planes would be on seasonal call and would be paid the same as the private companies. The end result would be a much better response by these aerial tankers that could suppress the fires quicker. Just something to kick around. Won’t be long before only the super wealthy can afford any insurance in the state or to have electricity. Then there’s those that just never carry insurance on cars or anything. The “middle-class” will be lumped into that group or be forced to give up much just to get by. Some of that wonderful trickle-up poverty. Don’t worry PG&E we will all still be designated your care takers. For decades and decades PG&E and SCE have been making certain that when John Q Public flips the switch in their living room, the lights go on. It’s really ALL the public has EVER given a crap about on the issue and boy oh boy, when the light doesn’t go on, there’s HELL TO PAY by that big ol’ mean nasty power company. Now this. Equipment is NOT infallible. People are not infallible. If there was some kind of proven gross negligence that was the cause, perhaps blame could be directed to a utility. Be looking for a new interpretation of negligence, though. There’s a Super Majority again. Look at the conditions we have experienced where these fires have BLOWN up as they’ve had. They’re unprecedented. The situation is horrific but true to form in today’s society, especially in “the once” Great State of California, everybody is pointing fingers as to who is at fault. If PG&E is thrown under the bus, I hope to God that the environmental groups like Forest Watch, et al go under the bus along with them to share the culpability. In fact, the environmental groups should carry MORE of the burden due to their constant intervention and forced paralysis of Land Managers that can no longer manage their forests as necessary by reducing fuel loads, creating breaks, and whatever else they need to do to provide for the safety of citizens. It already happened last year. “Gov. Jerry Brown signed a bill Friday to help Pacific Gas and Electric Co. withstand the costs of last year’s devastating wildfires, in part by passing some of those costs on to customers. This is going to get interesting. Ive heard word of dismantling PG&E a its a monopoly. Who then would supply power, the government eventually? God forbid. Im not defending PG&E by any means, but who would have known global warming and climate change would create winds or conditions more extreme than ever taking down lines or equipment or trees even knocking down lines.I keep reading articles about scientists who say bad management is not to blame, but every fire fighter including the Mayor/Fire Chief of Thousand Oaks Ca says otherwise. I say those scientists need to get off their asses and hit the fire lines.With historic weather conditions (the new norm) what historic preventative measures are now in place to eliminate these deadly occurrences? Take Cambria or the western Sierra for example or anywhere there is now thousands of dead pines from drought or diease.Years have passed and all we hear is bickering about who’s gonna pay, who’s gonna be responsible for what happens when it goes up in flames and no action. Forested ares in other states were literally closed this fire season to all activity, and in the midst of last years Napa fires Brown talked about stage 1 restrictions… maybe? You’ve head it before, its failed government, lack of pro activeness, negligence and damning regulations that have played a huge part in this and it needs to be reversed sooner than later.